The one thing is that this doesn't have the latest browsers. I figured that this community would be a good place to gather this info. Also the range of screen sizes varies much more now than it used to. Long gone are the days when it was unusual to see much other than 800x600 or 1024x768. There are a number of common wide-screen formats and small-format screens (i.e. those on netbooks and smartphones) are increasingly likely to be used to view your pages. Rather than designing around the viewport of a selection of specific examples (IE8 default, FF3.6 defaults, FF3.6 default but no tabs...) you should design for a reasonably full range, making sure your page doesn't fall apart completely on small screens nor become to wide to be comfortable readable on large wide screens. This does mean that pixel perfect positioning is an ideal you need to let go of, but it makes your content usable in the widest possible combination of conditions. 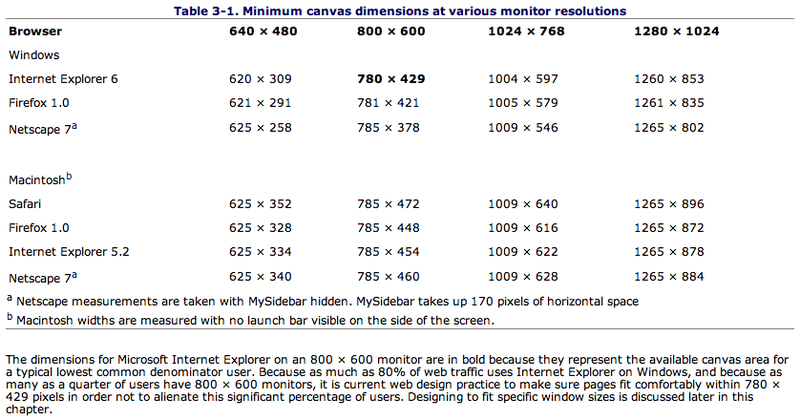 Google Browser Size shows an overlay of the percentage of users who have their browsers at certain resolutions. This also takes into account people who don't maximise the browser window, as well as screen resolutions. Is there an industry standard for “the fold”? Is browser and bot whitelisting a practical approach?